Applying to an internship can be stressful—but it doesn’t have to be! Internships are great opportunities. A Texas study showed that graduates who completed internships were 13% more likely to find a full-time job after graduation. They were also happier with their job outcomes (35.3% vs. 28.9%) than those who did not complete an internship (read more about this study here). So how can you snag that great internship? Just like a job application, some things make you look like a strong candidate—and some things don’t. 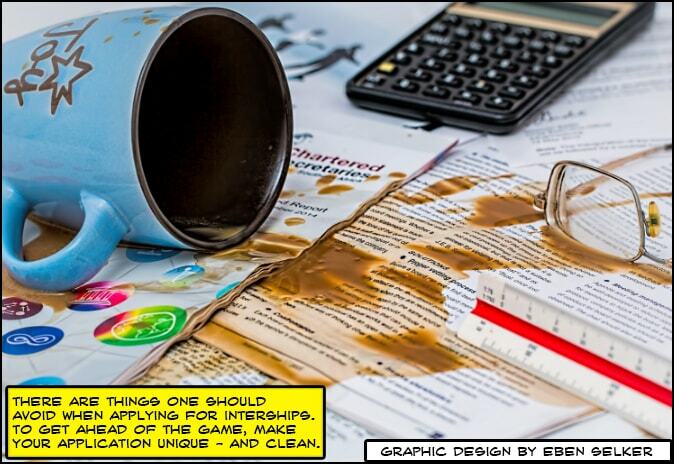 Check out these four common mistakes internship-seekers make (and what to do instead). Employers are not going to take you seriously if you submit a cover letter and resume with grammar errors in it. Avoid this mistake by carefully editing everything you plan to send—even better, have a friend check it, too. When you send a cover letter that says things like “your company,” “this position,” and so on, it stands out (in a bad way) to the people reading it. Show your interest by changing your resume to fit the position. Penny Loretto (a career counselor of 20 years) suggests looking for keywords in the internship posting and including these skills in your cover letter to show you’re a good fit for that company. You might think that once you push the “Send” button, you are finished applying to an internship. But doing nothing gets you nothing. In order to make sure you stand out, try to get in touch with the person in charge. Let them know you’re checking to make sure they got your application, and you’re available if they need anything else. This shows you’re interested and engaged. Keep this in mind and you will do great in your internship search! Or click here to read more about applying to internships.